The information provided here shows the result of the safety seat with the i-Base Isofix installation. This review represents the installation with the Joie i-Base Isofix but it can also be installed with seat belt. Joie i-Gemm is a very safe and lightweight seat with its 4.6 kg. Joie recommends to use i-Gemm for a maximum of 5 year period. It can also be used as a carrier and a travel system on several buggies and strollers with a Maxi-Cosi adapter, and also without an adapter on its perfect match, the Joie Chrome 3in1, as well as on most Joie strollers. Lie-flat or close to lie-flat position is not possible. The head is protected by 3 layers, including a memory foam called Intelli-Fit™. Side impact protection is provided by the patented Intelli-Fit™ foam. You can adjust the headrest and the padded harness with a central adjuster easily with one hand into 7 different positions. A full body and head insert comes with the seat to support newborn babies. 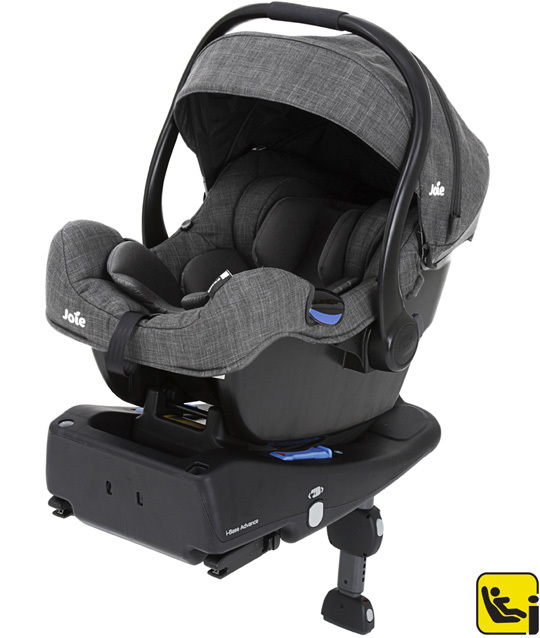 The base is curved so that you can also rock and relax your baby in the seat. A full coverage sun canopy with UPF 50+ is also part of the seat, that also has a zip-open mesh panel and it is also fully removable. If you choose to have the seat together with its base, you make the traveling safer for your baby and easier for yourself. You can see the result of Joie i-Gemm with safety belt installation here. The carry handle is ergonomic. There are two colors you can choose from, both of them are very elegant: pavement gray or black with white dots. I hope you liked this review and if you have any question about the JOIE i-Gemm (i-Size) seat with the i-Size base or want to leave your own personal experience, leave a comment below.